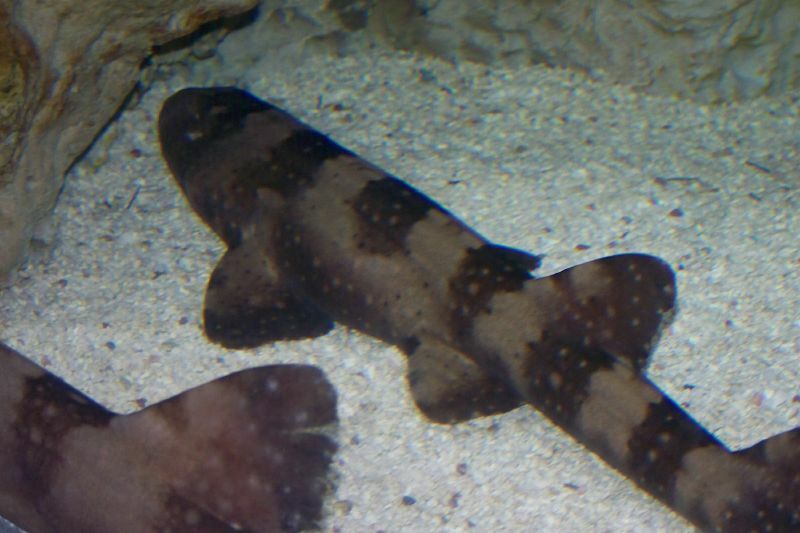 Species Profile: The Whitespotted Bamboo Shark - We Love Sharks! Species Profile: The Whitespotted Bamboo Shark - We Love Sharks! The Whitespotted Bamboo Shark is a strikingly beautiful and small shark that can “walk” on sand. The Whitespotted Bamboo Shark is a small, nocturnal, and completely harmless carpet shark species. These sharks are also referred to as “cat sharks.” That’s because they have nasal barbels near their mouths that gives the appearance of cat whiskers. But these barbels are actually sensory organs they use in locating prey hiding in sand. It’s occasionally kept as a pet in public and private aquariums because of its hardiness and pleasing appearance. The body coloration is very striking and distinct. Its body is very slender and elongated with a pattern of white and dark spots, dark bands and a brown body. The whitespotted bamboo shark spends most of its day resting on the sea bottom. One particularly interesting fact about them is that just like the epaulette shark, they can manipulate their muscular pectoral fins to “walk” on the sea bed. Unfortunately, this is another shark species highly sought after for its meat. As a result, it’s now classified as a Near Threatened species. Adults grow to a maximum length of 93 cm (37 in) long. These sharks are the more sedentary kind and are not considered among fast swimmers in any way. Below is a video uploaded on Youtube by ODN (On Demand News UK). It shows baby bamboo sharks released into their new home at Legoland Windsor as part of a conservation/captive breeding program. The whitespotted bamboo shark is completely harmless to humans and will not react even when handled. Because of their small size, docile nature, and bottom-dwelling lifestyle, they are often kept for display in home aquariums. These sharks feed, live, and breed readily in captivity and spend their day resting at the tank bottom. Or at the most digging for prey in the sand. The major problem this species faces now is that its meat is a delicacy in parts of Madagascar and Taiwan. Also, it’s used in traditional Chinese medicine and often taken as bycatch off the coats of India, China, and Thailand. Whitespotted bamboo sharks reproduce by laying eggs: hence they are oviparous. Each egg is about five inches long and will typically hatch after 14 or 15 weeks. Newborns measure just 6 inches long. Strangely enough, this is one shark species that has displayed parthenogenesis; the ability to reproduce without fertilization. It was first noticed in a female whitespotted bamboo shark when she laid eggs and successfully produced 3 young at the Belle Isle Aquarium in Detroit, Michigan. This female shark had no contact with any male sharks for six years before that time. The female had both male and the female reproductive organs. She may have stored sperm in her body for that long. She stimulated the eggs without any sperm – a virgin birth (parthenogenesis). The Whitespotted Bamaboo Shark is one of the very rare sharks to have ever displayed parthenogenesis (birth without fertilization). These sharks are not aggressive hunters/predators. They feed at night and go after small fish and invertebrates like crab and shrimp. Actually, their preferred hunting strategy is to sift through the sea floor searching for food and sucking in whatever they can find. The very sensitive electroreceptors along their snout (ampulae of lorenzini) helps them immensely in their efforts to find prey buried deep in the sand and mud. And although their mouths are relatively small, they have powerful jaws. Larger shark species are potential predators of Whitespotted Bamboo Sharks. This shark faces several threats majorly; slaughter for human consumption, habitat degradation from dynamite and cyanide fishing, getting caught as bycatch, and deaths from marine pollution. Consequently, the white-spotted bamboo shark is listed as Near Threatened by the IUCN. English zoologist Edward Turner Bennett first described the whitespotted bamboo shark in 1830. It’s a member of the family Hemiscyllidae along with several other bamboo shark species and the carpet sharks. It’s scientific name Chiloscyllium comes from the Greek word “cheilos” which means lip and “skylla” for kind of shark. These sharks dwell mostly on coral reefs of the Pacific Ocean. Also, they are endemic off the coast of Indonesia and extending all the way to Japan and India. Generally, the palearctic region in Asia. Sightings are common around Madagascar, Sri Lanka, Malaysia, Singapore, Thailand, Vietnam, China, and the Philippines. Their slender bodies allow them to quickly glide between coral branches and even hide in the crevices of reefs when necessary.